ASELLA, according to St. Jerome (30th September), who referred to her as “a flower of the Lord”, St. Asella received monastic tonsure at the age of ten, and became a hermitess in Rome at the age of twelve. In time a community evolved around her of which she was the abbess. St. Asella reposed circa 406. AUXILIUS, ISSERNINUS, and SECUNDINUS, (Fifth Century), it is generally believed that SS. Auxilius and Isserninus accompanied St. Patrick’s (17th March) forming the core of his first group of missionaries to Ireland, and that St. Secuninus either accompanied them or followed soon after. As the success of their mission grew, St. Patrick sent them either to Britain or Gaul to receive episcopal consecration, after which they returned to Ireland. 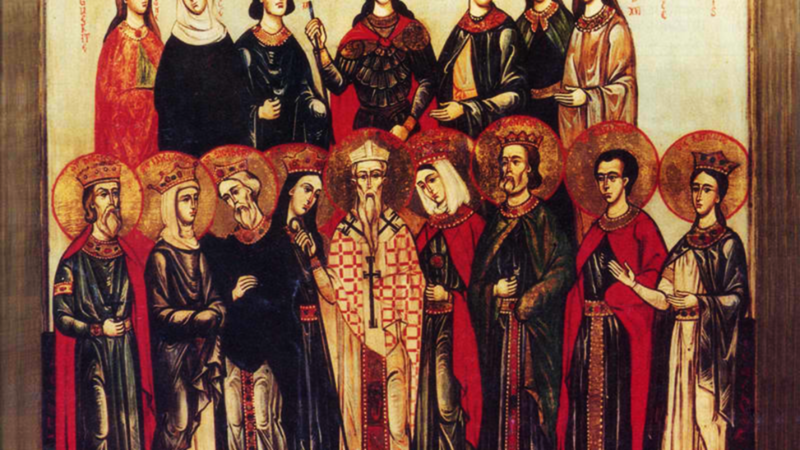 DIONYSIA, DATIVA, LEONTIA, TERTIUS, EMILIAN, BONIFACE, and COMPANIONS, a group martyred in 484 in Proconsular Africa, during the reign of the Arian Huneric, King of the Vandals (r. 477–484). According to Victor of Vita, Dionysia, her young child, Majoricus, and her sister Dativa were scourged and then burnt at the stake. Emilian and Tertius were flayed alive. The others met with equally horrible tortures and deaths. GERTRUDE the ELDER, a widow, and mother of three sons, including St. Adalbald (2nd February), and Sigebert who married the future St. Bertha (4th July). Following the death of her husband, St. Gertrude founded the Abbey of Hamage, in present-day Nord-Pas-de-Calais France, and served as its first Abbess. St. Gertrude reposed in 649. MAJORICUS, martyred in Proconsular Africa, circa 484, during the reign of the Arian Huneric, King of the Vandals (r. 477–484). His mother, St. Dionysia (26th October), encouraged him while he was being martyred, and then buried in her own house.